“Everyone says I look a lot younger,” says Terry. Even though she had previously had braces, she was not happy with the look of her smile. 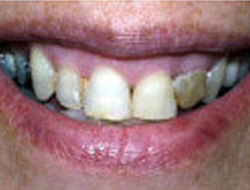 “Now, they definitely look straight and much whiter as well.” In Dr. Harold Pollack’s endeavor for continuing education, Terry accompanied him to the nationally-renowned Rosenthal Center at New York University where he applied laminates and crowns to improve Terry’s less-than-satisfactory smile. Porcelain laminates are thin, custom-made veneers of high-strength porcelain bonded to the front surfaces of teeth. They are used to correct gaps, color, and poorly aligned and shaped teeth. 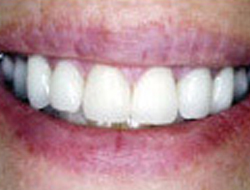 Porcelain-bonded crowns now use a high-strength porcelain to eliminate the unsightly gray lines that sometimes show with older crowns. 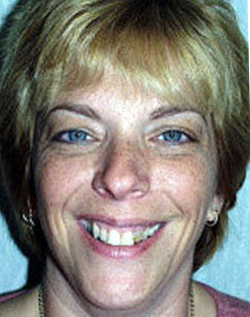 “I was a little nervous before the procedure and was very happy to find out that it didn’t hurt a bit!” Terry said. “Dr. Harold Pollack is truly an artist – and one with a gentle touch. I was amazed at the amount of work he did in such a short period of time, and I couldn’t be happier with the results!” she also said. Terry’s smile is now one that she is proud to show off!